Friday 7 September 2018 will be remembered as the first time these ears have tuned into the official UK albums chart rundown in well over a decade, if not any kind of chart rundown at all since the BBC decommissioned Top Of The Pops in the summer of 2006. 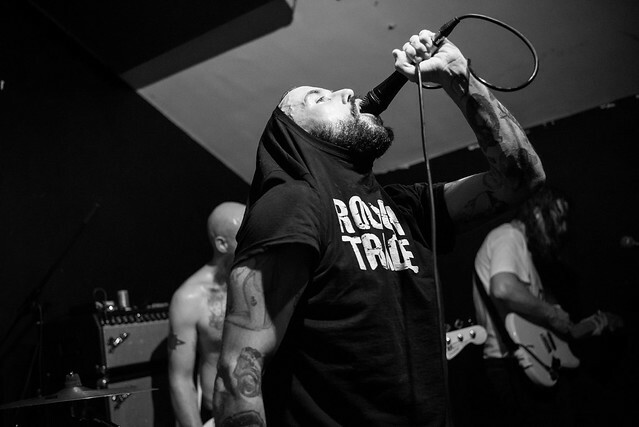 Yet in the week leading up to that Friday's 5pm announcement, conversation - both online and in the flesh - has revolved around one talking point: Will Idles make the top 5? 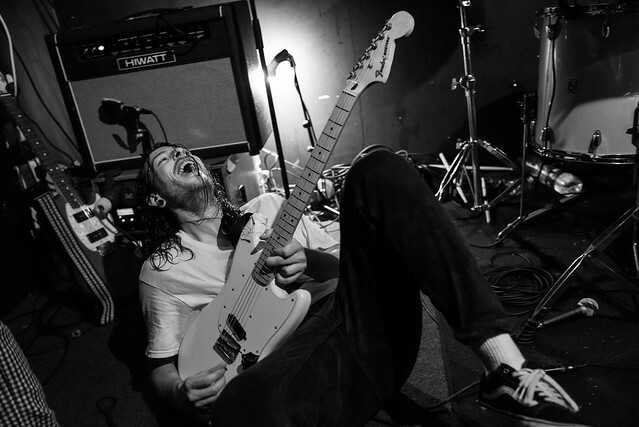 Idles. That band from Bristol. That band who write songs almost everyone I've ever met can relate to. Arguably the first band to capture the public's imagination since I don't know when (someone mentioned the Arctic Monkeys' meteoric rise 13 years ago). There hasn't been an album so eagerly awaited then rapturously received as the band's near-flawless second, Joy As An Act Of Resistance. Namechecking Michael Keaton, Dennis Skinner and Freddie Mercury is one thing. Creating a record that not only nails the zeitgeist, but the general feeling at the state of its surrounding mess known as the world quite another. It's astonishing to think that only this time last year, having released their debut Brutalism at the start of 2017, they found themselves nestled near the bottom of many festival undercards. Those riotous scenes at Groningen's Vera and the upstairs room of Vines Bar in Derby seem like another lifetime now. Yet even then, first hearing songs like 'Mother', 'Well Done', and 'Rottweiler' - a staple of their live set over a year before its eventual release last month - whilst experiencing their raw intensity in the flesh is something that will remain in the memory for a very long time. Which pretty much confirms why we're here at the halfway point of a week that will see them cram nine shows into five days, all but one of which are scheduled to take place in record stores (Leeds tomorrow was also planned to be a similar affair but ended up being moved to The Wardrobe due to exceptional demand). Which isn't to say any of the other shows couldn't have easily been upgraded either. Our first stop is Sheffield, a city steeped in a musical history of its own making. From the electronic post-punk of Cabaret Voltaire and The Human League on to Warp Records' groundbreaking minimalist techno, through to Pulp and The Long Blondes separate tenures as the most glamorous pop bands on the planet, and culminating in the Arctic Monkeys' phenomenal growth to international megastardom and the scene that still exists in their wake. It's also one of the most welcoming cities for new music from around the globe, and DiS are already greeted by a long queue outside Record Junkee over an hour before its doors are open. Taking solace in one of the city's most popular watering holes The Rutland Arms, we encounter a couple of Idles devotees who've travelled from Coalville and Huddersfield respectively. Both members of the AF Gang, an online Idles fan page that currently has over 8000 members and is growing rapidly by the day, they tell us about their first Idles shows and how many times they've seen them since. It's this kind of all encompassing, community spirit that makes them such an engrossing act - not least because the band themselves are all approachable and willing to spend as much time as possible talking to their fans. 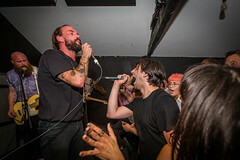 When the doors open, the lucky 150 who secured wristbands for the show are treated to almost an hour's worth of audience requests, singer Joe Talbot picking out crowd members at random before asking where they're from and which Idles song they'd like to hear. The responses vary from 'I'm Scum' off the new record to early single 'Queens', numerous highlights from Brutalism, and even one shout for Wham's 'Last Christmas', which is met by Talbot and Mark Bowen's now familiar rendition of Mariah Carey's 'All I Want For Christmas Is You' instead. Afterwards, the band spend another hour or so signing records, posing for photos and talking to fans, many of whom are already on first name terms with each other. It's a throwback to an era before the internet and social media where word of mouth would orchestrate organic growth resulting in an artist's profile spreading far and wide. There are echoes of The Clash back in punk's heyday and the Manic Street Preachers' initial foray into public consciousness fifteen years later, and while the aesthetics and music might not be the same, the ethos certainly is. 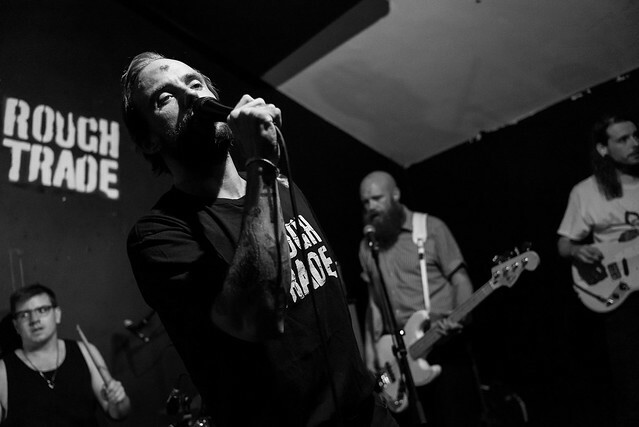 Lindsey Melbourne, one of the founder members and moderators of the AF Gang, tells us how the Facebook group has brought kindred souls together while kindly offering us a lift to Nottingham for Idles' second performance of the day. "The group started to grow in numbers just after Brutalism came out last year," she tells us. "Once more people from outside of Bristol heard about the band the opage started to grow. Last week alone we added over 400 new members, and we're currently in the process of making a film about the band and their fans." On arrival in Nottingham, Zeb, our earlier acquaintance from Coalville, decides to seek out a local tattooist to have "I'm Scum" tattooed on his lower leg, such is his devotion to the band. As with the matinee show, queues are already building outside Rough Trade long before doors are due to open. 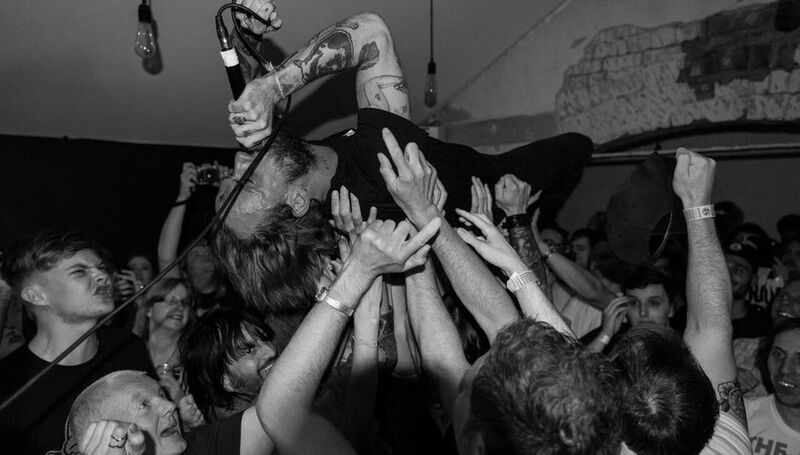 The band haven't even arrived yet Idles mania has already gripped what would normally be a quiet Wednesday evening in this provincial city. Kyle Hougham, manager of Nottingham's Rough Trade shop, is already bracing himself for a busy night ahead: "It's going to be mayhem up there!" While the Rough Trade cafe bar - situated directly above the shop - caters for 200 people, it's a tight squeeze getting into the tiny area in the corner reserved for live shows. There's already a clamour of fans and photographers, most if not all tightly clutching albums as they prepare for the melee about to ensue. What's most notable is the demographic, which ranges from eleven year old school kids to a couple of people in their late sixties, both veterans from the first wave of punk and before. "They speak to us," quips one of them when asked what attracted them to Idles. Taking to the stage slightly later than scheduled, Idles open with 'Colossus' and 'Never Fight A Man With A Perm' as they did in Sheffield this afternoon before inviting audience members to request their favourites. Someone asks for a song off their very first (Welcome) EP, a request that's met with a few giggles, not least from guitarist Lee Kiernan who wasn't in the band at the time. 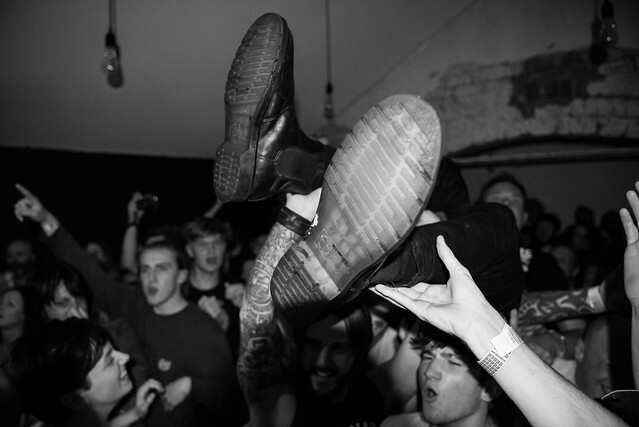 Instead, they deliver a raucous version of 'The Idles Chant' off 2015's Meat EP which triggers a sea of crowdsurfers that doesn't subside until the end of the show. 'Divide & Conquer' sees the amiable frontman Talbot join in himself, eventually hanging upside down from one of the rafters while singing the second half of the song. Guitarist Kiernan also joins the throng out front for 'Exeter', perspiration now dripping off the walls and ceiling. A selection of songs from both records follow thick and fast; 'Benzocaine' and '1049 Gotho' from the first alongside 'Danny Nedelko' and 'I'm Scum' (dedicated to Zeb and his tattoo) from the follow up, before a rousing 'Samaritans' brings the second set of the day to a close. The show might be over and several buckets of blood and sweat deposited in the process but that doesn't stop the band from sticking around and engaging with those who've turned up to witness such an explosive performance. Long after the venue has officially closed (and even stopped serving behind the bar) an orderly queue snakes around the room, waiting patiently for their opportunity to discuss the events of the day. Fast forward 48 hours to Friday afternoon and the album chart is revealed. Joy As An Act Of Resistance has come in at number five, three places lower than its midweek position but still a triumphant result for a DIY act on an independent label. More importantly, one of ours has infiltrated the mainstream in a week many of us will never forget. Long may the phenomena that is Idles continue. Joy As An Act Of Resistance is out now via Partisan Records. 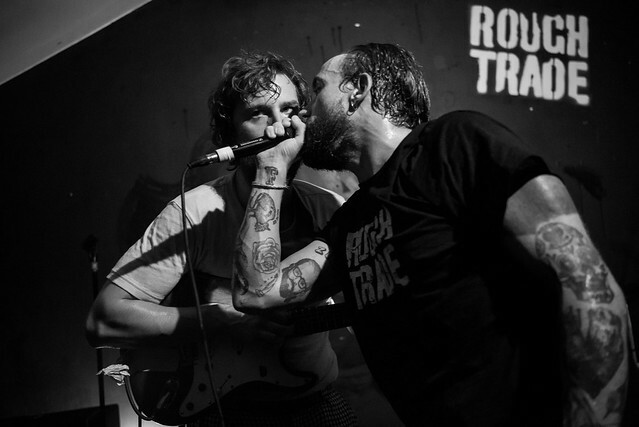 For more information about Idles, including forthcoming tour dates, please visit their official website.